"Keep Pushing the Boundaries of Flintknapping"
Bill has lost almost all feelings in both his hands. He underwent carpal tunnel syndrome surgery on his right hand on 2/4/19 and his right hand is now improving but his left has worsened greatly to the point that he can not flintknapp at this time. He will be having surgery on his left hand in the near future. Bill Earnhardt is 75 years old and started beating on slate when he was only 10 years old, but considers his years as actual flintknapping at 55 years. Bill is known for his unique technique of pressure flaking and specializes in making super thin pieces ranging from .115 to .15 inches thick. In Bill's version of modern flintknapping, he will take artifact designs and add his artistic flair and change their design in various ways. He may blend various designs into one piece making a hybrid piece. He will also come up with totally new designs. Recently a younger breed of knappers are carrying this on, such as Jake Webster and his "Ghost Points". We are very happy to see the art of flintknapping continuing to progress. Bill mainly does FOG(flake over grind) style of knapping but he also does percussion work with copper and antler. He has also designed his own unique type of pressure jig that he uses to make some thin Caddo and Laurel Leaf style blades. Q) At what age did you become interested in making arrowheads and bows? A) Around 10 yrs. of age I would go to a slate pile back in the woods with my younger brother Jerry and we would try to make arrowheads. We started making bows and arrows around that same time and I have a bow I made when I was 12 yrs old. Jerry helped me continue my quest in flintknapping throughout the years. In later years, he once commented that flintknapping was "a childhood game Bill just never grew out of". Jerry passed away in 2004 and I dedicated my video titled "How To Pressure Flake A Thin Blade" in his memory. Q) Who was the first person who helped you in flintknapping? A) A professor of Archaeology from Catawba College in Salisbury NC, the late Peter Cooper. I started putting on flintknapping demonstrations for his students in the 1970's when I was around 30 yrs old. Q) Who was the first other flintknapper that you ever meet and how did that meeting come about? A) In the early 80's, my son Dwayne and I traveled to Kentucky to meet Robbie Robertson who was the only other flintknapper that I ever heard of who lived anywhere near me. We spent two days together at his house flintknapping right on the Ohio river , that was before there were any knapins around here. Robbie told me there was a guy in Missouri named Jim Spears who was also flintknapping. Q)What kind of pieces did you first start making and what technique did you use? A) I started making arrowheads to hunt deer. I was doing percussion and indirect percussion at that time. Now I use FOG to make my hunting points. Q)How many deer have you taken with them? A) To date, 10 deer, I was actually the first non native american to take a deer with a flint point in NC and SC. The newspapers the Greensboro Daily News had an article about me in 1967 and the Salisbury Post in 1971. 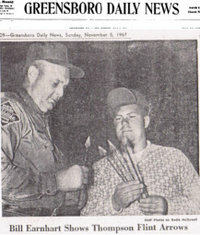 The magazine Low Country Sportsman out of SC did an article on me in the Spring 1974 edition. Q)Have you ever been interviewed by any other media besides the newspapers? A) I was on a weekly tv program called Carolina Camera , hosted by C. J Underwood in the 1970's. 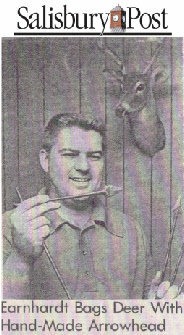 During the show, I demonstrated making arrowheads which was mainly by indirect percussion at the time. Q) What characteristics/material have you found to be the best for a hunting point? A) Texas Flint seems to work the best. I have found that thinner the point the more penetration you get which increases your success rate. Obsidian actually has a sharper cutting edge but the points break easily on contact so i quit using them to hunt with. Q) When did you first start using the FOG technique? A) I started using FOG in 1991 because you could get the points thinner and they were easier to balance in the arrow shaft. Q) Your FOG pressured flaked pieces are very thin, do you consider this your specialty? A) Yes, I would say that is my specialty, although I do percussion work as well. Q) What brought about the making of your instructional video? A) When I was at knapins people were always asking me how I made my pieces so thin. Since it was virtually impossible to take an electric grinding wheel it was hard to demonstrate how to grind out a preform to make a thin blade. I think maybe some people thought I was being illusive or trying to keep secrets on how I did my work. But that wasn't the case at all, so I decided to make the video so everyone could see the process involved.